FORMER Camden alderman Professor Roger Jowell has been given a knighthood in the New Year Honours List in recognition of his services to social sciences. Professor Jowell, who lives in Belsize Park and teaches at City University, has become a leading expert in analysing social and political attitudes. For nearly two decades in the 1980s and 1990s he led research into voting behaviour. Sir Roger, who was awarded a CBE in 2001, said the knighthood reflected a new respect for social scientists. Sir Roger became active in Camden politics in the 1960s. He moved to London in 1964 from Cape Town, South Africa. He had been involved in student politics as the president of Cape Town University’s student union in his home country, fighting the apartheid regime. He first came to London on a short visit and planned to return to Africa. However, he settled after hearing how many of his fellow students in his home country had been arrested and harassed by the regime. After receiving British citizenship he was able to travel back to South Africa and highlighted the plight of the black majority. He found a home in Kentish Town and was appointed an alderman for Camden Council in 1970, where he served alongside his ex-wife Tessa Jowell, whom he married in 1970 and who is now the government’s Olympics minister. He also became the chairman of the Hampstead Labour Party. While serving as an alderman he sat on Camden Council’s community race relations committee. It was from here he helped organise a borough-wide boycott of South African products and services. Fellow councillor Conservative Martin Morton argued that he wanted to visit South Africa as his father had been born in the country and both his grandparents had been buried there. It led to lively debates between the pair, and the council eventually adopted a blanket boycott of the apartheid regime. 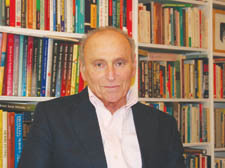 Sir Roger founded City University’s Centre for Comparative Social Surveys and was the Director of the National Centre for Social Research, which he started in 1969. He won the Descartes Prize in 2005 and was the first social scientist to scoop the European Union-sponsored prize for excellence in scientific research. THERE was recognition in the New Year Honours for a host of familiar Camden faces including a campaigning journalist, a pioneering soul music producer, the new director of the Barbican and the design guru who has breathed new life into a Tufnell Park school. Sir Nicholas Kenyon, who lives in Constantine Road, Hampstead, with his wife and four children, was knighted after being credited for extending the reach of classical music while working as director the BBC Proms for 12 seasons. He switched jobs in October to take over the reins at the Barbican. There was also a knighthood for design expert Sir John Sorrell, who lives in Highgate. He is the former chairman of Britain’s two publicly funded design bodies – the Design Council and the Commission for Architecture and the Built Environment. In the 1980s, he established a successful design consultancy with his wife Frances and made headlines when he redesigned the tail fin of British Airways planes, scrapping the use of the Union Jack. After selling his design business, the husband and wife team established the Sorrell Foundation in 1999 which helps schools offer design courses and recently worked on a revamp of Acland Burghley school’s playground and canteen. The first female chief executive of the world’s most comprehensive research collection, the British Library in King’s Cross, has been made a dame. Lynne Brindley, who lives in Roseberry Avenue, Islington, is also the first librarian to receive the post. Marjorie Wallace, a journalist who established the charity and pressure group SANE in the late 1980s, which set up the first dedicated helpline for people with mental health problems, was awarded a CBE. Ms Wallace said although she felt honoured to have been awarded the gong, she said her greatest accolade was a tribute written to her by her former colleagues at the Sunday Times this year. Equality campaigner Angela Mason, who lives in Camden Town, was also awarded a CBE. She served for 10 years as director of Stonewall and later worked with the government to oversee the introduction of civil partnerships. Soul star Jazzie B, real name Beresford Romeo, also from Camden Town, received an OBE for his services to music, notably raising the profile of Black British music through the group Soul II Soul. Judith Hassan, 61, who lives in West Hampstead and works at Jewish Care’s Holocaust Survivors Centre in Hendon, was given an OBE. Other awards saw CBEs for Professor Valerie Lund, Professor of Rhinology at the Royal National Throat, Nose and Ear Hospital and John Condron, chief executive at Yell Group, and an OBE for Colin McDowell, the fashion journalist who lives in Kentish Town.